We have been having a lot of fun with Ghost Week! We kicked it off by making mini ghost windsocks and doing a ghost number hunt. 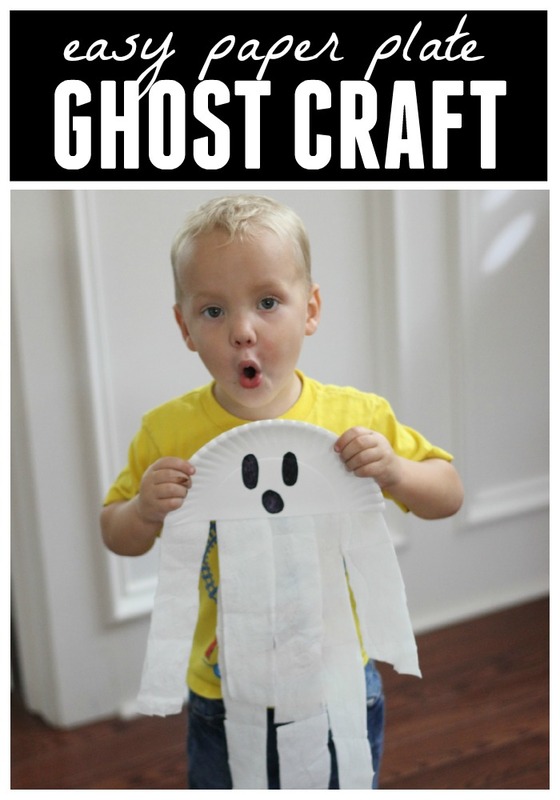 Today we are sharing a super easy paper plate ghost craft! This would be a perfect Halloween party craft if you want to keep things super simple and use very few materials! Start by cutting your streamers of pieces of toilet paper into long strips. My little guy loved this part because he LOVES cutting with scissors! Next draw a ghost face on your paper plate half. Turn over the paper plate and add double stick tape along the end of the plate and have your child stick the paper/streamer strips onto the tape. Once you've covered the entire edge of the plate your ghost is finished!! Didn't I say this was easy? Once we finished we grabbed our ghosts and made ghost sounds and faces while we flew our paper plate ghost around the room.